DAMAGE DEALT: Using the club, 4 - 6 per hit. Using the gun, 3 per bullet. Fires at a rate of 3 or 4 bullets per second. "Strong, muscle-bound warrior who dishes out chain gun speed damage." 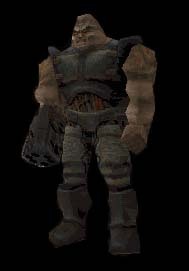 The enforcery has a chaingun as a weapon, but does not fire it often - he is apparently only capable of firing his gun continuosly for about five seconds, after which he pauses to reload. If you are close to him, he will lunge at you weilding his gun as a club. Despite what the readme file states, enforcers are relatively weak unless in groups - he will often stagger backwards after being shot, rendering him completely vulnerable. He can not take much damage either: he has only 100 hit points, meaning one shot with a super shotugn can take his head off. He has an interesting death sequence: sometimes after having his head blown off, he will fire his gun wildly in the air and collapse to the ground. After he dies, flies quickly cover his carcass.